Did Santa pack a Las Vegas Christmas vacation for your family this year? This city, known for its lights year round, is a fun family destination because businesses go all out with holiday décor, free outdoor festivities and hotel offers. Keep in mind that Las Vegas can be colder in winter than visitors expect. So lay out your holiday finest, choose your most stylish walking shoes, throw in some mittens, and you’ll be all set to take advantage of our guide to the best holiday activities for families. Lantern display at Global Winter Wonderland, a Las Vegas popup attraction. The LINQ Promenade is the development housing the famous Ferris wheel, High Roller, that towers 550 feet over The Strip to give visitors a sky-high view of the lights below. Lots of the fun is free, with a 35-foot holiday tree adorned with lights and ornaments on the Fountain Stage. The LINQ is easily accessed via the city’s Monorail stop, Harrah’s/The LINQ. In addition to the LINQ Hotel and Casino, there are shops and the Brooklyn Bowl – considered more of a music venue than a bowling alley. Restaurants to suit every taste and wallet in this foodie town include Guy Fieri’s Vegas Kitchen & Bar, Chayo Mexican Kitchen + Tequila Bar, Hash House A Go Go is a millennial favorite for its huge breakfasts and exotic menu) and, for the kids at heart, a branch of Sprinkles, a cupcake shop that delivers tiny treats after hours through an ATM machine. In 2016, the LINQ Promenade started its annual transformation to Winter PARQ, with free nightly “snowfalls” accompanying a light show using 2,000 lights syncopated to music (6pm-10pm through Dec. 30). The High Roller ($25/adults and $10/kids ages 4-12 during the day) hosts “Story Time with Santa” on Sundays, noon to 3pm. Go Global for the Winter! 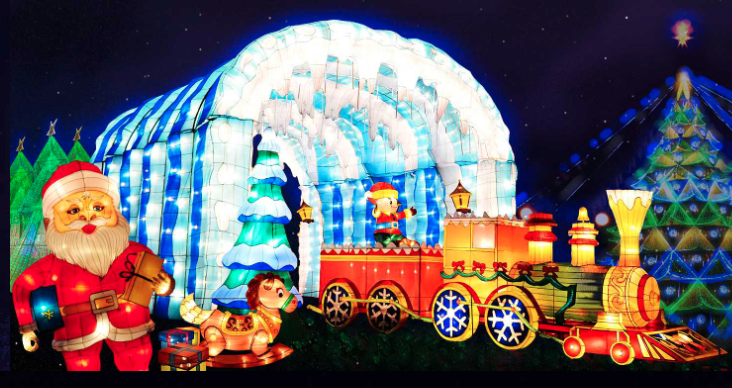 Self described as a multicultural theme park, the Global Winter Wonderland is a purpose-built, popup holiday attraction that will be in residence next to the Rio Hotel & Casino from Dec. 14-Jan. 20, 2019. Among the 15 acres dotted with international landmarks, enormous holiday lanterns and wintry scenes, families will find carnival rides, a kids zone with ball pit, photo ops with Santa and booths selling crafts and foods from around the world. A DJ and bar are there to entertain the over-21s inyour group. Admission ranges from $17 to $23; more details at Global Winter Wonderland. Snow also falls on Town Square Park and a 45-foot Christmas tree. During November and December, visitors can enjoy “Snow in the Square” and “Holiday Nights & Lights Community Concerts,” where local school choirs will perform classic carols at no charge. The free Fremont Street Experience downtown is transformed by a 50-foot- tall tree under the spectacular canopy of lights that plays year round. Be there Dec. 24 for the Grand Menorah Lighting Ceremony. If you don’t have a car for your Las Vegas Christmas, call an Uber to see Glittering Lights at the Las Vegas Motor Speedway. Featuring more than 3 million lights along a 2.5-mile course intertwined with the speedway, this paid event is a family favorite for locals. You can upgrade to a premium ticket and also hop the Santa Tram for an eco-friendly ride, photo op with Santa, hot chocolate and popcorn. It’s open through the first week in January. Families with preschoolers really enjoy the indoor Adventuredome amusement park at Circus Circus. The 5-acre theme park also puts on a festive face, and hosts special performances by bands, dancers and carolers for the most wonderful time of the year. Guests can also enjoy holiday drinks and treats, and photos inside a giant snow globe. Note that admission is free, but you’ll have to pay for whichever rides the kids choose to go on. Of course you’ll want to stop at the Bellagio Hotel, whose famous fountain of dancing waters is a family highlight any time of year. For the holidays, the Bellagio Conservatory changes its garden display to floral arrangements featuring a polar bear family, elves, a model train and a 42-foot holiday tree embellished with twinkling lights and ornaments. The same hotel group’s horticulture team transforms the Wynn Las Vegas public spaces into a winter wonderland with five distinct fantasy villages, 33 holiday trees and more poinsettias than the kids can count. It’s a Las Vegas Christmas experience you don’t want to miss. Try to stop by the beautiful Mandarin Oriental Las Vegas when students from the Las Vegas Academy of the Arts choir perform holiday classics, in the Sky Lobby, Dec. 19-22. Another not-to-be-missed free display is The Palazzo Waterfall Atrium Gardens, where frosted trees reflect the lights and water. Getting hungry by now? Four Season Hotel Las Vegas – one of the very few hotels without a casino — will host its annual gingerbread display created by Pastry Chef Jean-Luc Dual, and you just might be able to grab a Hot Holiday Happenings at The Cosmopolitan Las Vegas. Overlooking the heart of Las Vegas Boulevard, The Ice Rink at The Cosmopolitan sends chills up our spine with its amazing skyline views reflected off more than 4,200 square-feet of real ice. In addition to a transformation of the hotel’s Boulevard pool, visitors will find rental skates, a fire to roast S’mores over, scheduled snow showers, and a few stylish places to enjoy seasonal treats and beverages. Additionally, ‘Date Skate’ Mondays welcomes lovebirds to a movie date night on ice as two classic holiday movies are shown each and every Monday night on the resort’s digital marquee. Need a discount hotel for your Las Vegas Christmas? Get the latest deals here. There’s plenty to see and do during a Las Vegas Christmas, so don’t be shy about rounding up the kids and painting the town red. Just make sure it matches the color of Santa’s jacket and holiday decor. And of course, if you do want to see top Las Vegas shows, there are kid-friendly options from Blue Man Group to Penn & Teller magic shows. You can look for discount tickets with Best of Las Vegas. There’s more to see and explore beyond a Las Vegas Christmas adventure. See more holiday light celebrations and fun across the country with our Top Holiday Lights and Christmas displays in America. Great article! Wanted for Christmas again. Do you know anything about this place ? It is very interesting to know the opinions. How much advance it is necessary to book a hotel and various entertainment before the holidays?